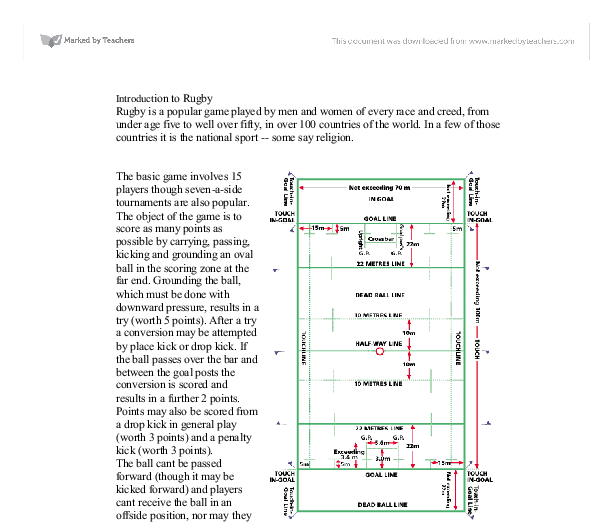 Introduction to Rugby Rugby is a popular game played by men and women of every race and creed, from under age five to well over fifty, in over 100 countries of the world. In a few of those countries it is the national sport -- some say religion. The basic game involves 15 players though seven-a-side tournaments are also popular. 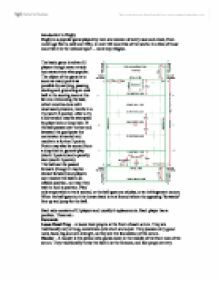 The object of the game is to score as many points as possible by carrying, passing, kicking and grounding an oval ball in the scoring zone at the far end. Grounding the ball, which must be done with downward pressure, results in a try (worth 5 points). After a try a conversion may be attempted by place kick or drop kick. If the ball passes over the bar and between the goal posts the conversion is scored and results in a further 2 points. Points may also be scored from a drop kick in general play (worth 3 points) and a penalty kick (worth 3 points). The ball cant be passed forward (though it may be kicked forward) and players cant receive the ball in an offside position, nor may they wait in such a position. Play only stops when a try is scored, or the ball goes out of play, or an infringement occurs. ...read more. The blindside being larger as he has a more physical role to play at the lineout and may well be used No 8 or Lock - Packs down at the rear of the scrum and therefore controls the ball out of the scrum. A very influential position and is often used to attack with a pickup of the scrum. Normally tall and athletic and used as an option to win the ball in the lineout. Backs Scrum Half - The person who is the link between the forwards and the backs. Normally acts as the 'General' for the forwards and is always in the hub of the action. A scrum half is normally quite small but with a high degree of vision and speed off the mark, and pound-for-pound is very strong. They have to able to react to situation very quickly. A key player in any side. Fly Half - Often considered the most influential person on the field the fly half is the person who makes the key decision during a game. Responsible for deciding whether to kick or to run the ball, the fly half should be very fast, able to kick off both feet and operate in pressurised situations. Centre - Centres provide the cutting edge to a side. ...read more. The "pushers" had to be called "pushers" because that was the action they took and was self-explanatory. The addition of the "h" to the end must now appear obvious, in retrospect. In order to tie the game to the sea further, the "squid" was a generically convenience. At no time had Southsea considered the unimaginative and non-descriptive [name] "underwater hockey", ice or grass, as an alternative to the 37 years of establishment of Octopush. Octopush was devised with its own rules and original name as an underwater competitive sport for divers in its own right, not as an adapted land game. The original rules had two differences that belong to the past era. The restriction of overarm strokes was a direct adherence to the BS-AC pool rules at that time, similarly jumping in from the edge was forbidden. (Many Bath Superintendents opposed diving clubs using their pools for fear of broken glass.) The non-use of snorkels was also to pacify the Bath Superintendent regarding broken masks, but also to avoid being used as a second implement that would have allowed "dribbling" the squid, so altering the intent and character of the game. The use of snorkels came in once Octopush was disciplined. Competitions were held with our two neighbouring branches Bournemouth and Brighton in the 1954/55 winter. In March 1955 the first invited public demonstration was held at the Portsmouth City Baths in the Southsea BS-AC Gala. ...read more. Performance analysis of passing and tackling in rugby. about keeping the ball in hand and forming the ruck over the gain line. On a couple of occasions the performer found himself with the option to offload but clearly a lack of confidence was present and he took the ball to ground. On the other hand, I believe that the bleep test and the US Navy muscle endurance test were not reliable. This is because they are not easily repeatable as they take up a lot of time, require lots of motivation and the athlete is likely to be in pain after the first test. There are a certain amount of activities that girls can't participate in due to gender. The level of motivation that the coaches have in the women is much lower than that of the men. The men are pushed harder and further than the women as it is believed that the men are more physically stronger than the women. hook the ball backward with their feet to one of the backs, called the scrum half. Having received the ball, the scrum half has several options: running with the ball until downed or until there is another chance to pass the ball, kicking the ball downfield, or immediately passing the ball to team-mates.